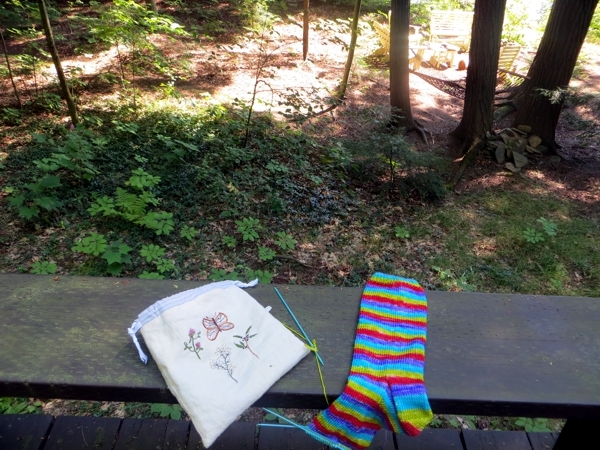 It just isn't summer without a patch of peaceful knitting in it, don't you think? Knitting in summer is special because it's so indulgent. Knitting in the fall or winter is just natural - it's cold enough outside for hats and mitts, gift-giving opportunities abound, and the bright colours in your hands are just cheerful. 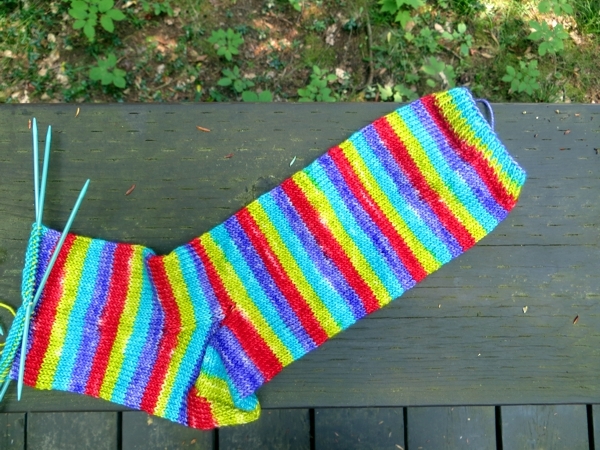 Once the warmer weather hits, it can be harder to justify knitting your tenth pair of subzero-friendly socks. Still: summer. In summer people are supposed to take a few breaks here and there, not head down to their basements and spend two months clearing out five years' worth of Stuff. Blech. And here we are with just a few days left of August... and the basement still not done, in case you were wondering. Maybe I should accept that it will never really be done, but I was hoping for more than two days of clear space in there, even after all the other spaces get tidy. Technically summer doesn't end when August does, but my summers always do: 18 years of it during my formative years have trained me so well I've never been able to leave the academic schedule behind. I still see the first school day of September as the first day of my own new year and that means any mindful summer knitting I'm going to get has to happen now. So: yay for the cottage, where I can't overhaul the basement even if I want to! When you go downstairs at the cottage, you're heading to the forest path to the lake. And while there are all kinds of things down there, they are very much meant to stay, even if it's only briefly, as with mushrooms. So. Many. Mushrooms. And some of them are very pretty. I should be taking pictures of them, shouldn't I. 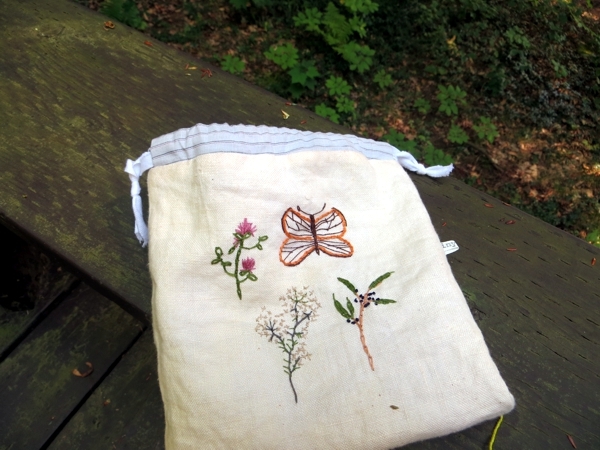 Lots of other little flowering bits and flying things too, which makes this other little bag from tinyhappy the ideal thing to knit from while I am cottaging and the perfect reminder of all those little plants while I am not. What about you? What does your end of summer knitting look like? I know exactly what you mean about the academic year signalling the end of summer! We never get over that feeling I think. Also, for us Torontonians, the beginning of the CNE means back-to-school soon, no matter how old we get.